Description: Perennial herb with short, erect stems, glabrous to sparsely hairy. Leaves tufted, lamina broad-ovate to ovate-rhombic, mostly 0.5–15 mm long, 0.5–12 mm wide, base wedge-shaped and tapering into petiole, margins coarsely toothed; petiole 1–3 cm long. Scapes 3–8 cm long; bracteoles near the middle. Sepals 2.5–3.5 mm long. 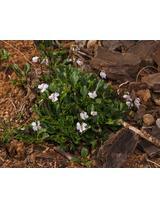 Petals 4–7 mm long, pale mauve to white, ± concolorous; upper petals narrow-oblong to ovate, lateral petals glabrous or slightly bearded. Capsule ovoid, 4–5 mm long. Distribution and occurrence: Grows in moist ground on more exposed sites. Main occurrence in Sydney region. 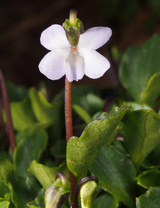 Hybrids between V. hederacea and V. sieberiana occur with the broader leaves of the former and the smaller, ± concolorous flowers of the latter.